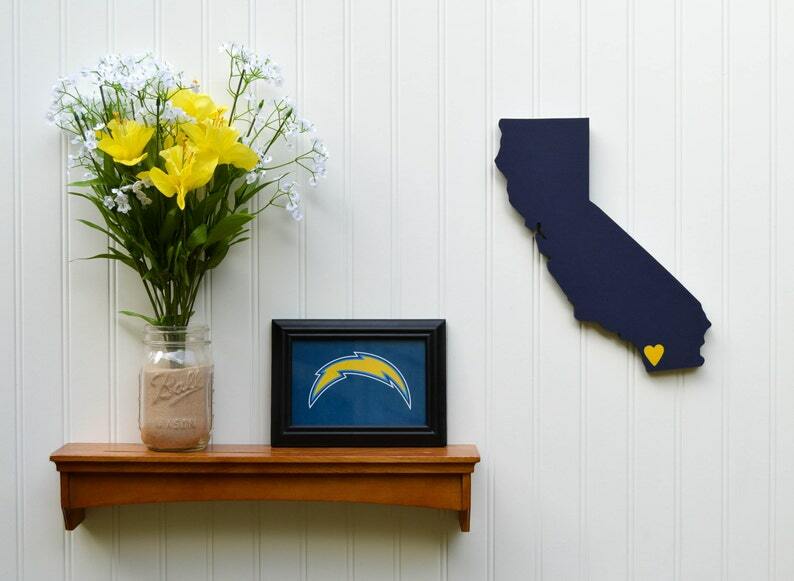 San Diego Chargers "State Heart"
Production Time: 5-7 days, sometimes quicker depending on our current workload. Position: Your favorite wall at home, the office, dorm room....you name it! Heart Location: San Diego, CA. Contact us if you'd like it moved to a different location. How to hang: Each state has a small sawtooth hanger attached to the back. Because they are so light, it requires only a small nail or tack to hang. - The picture frame is NOT for sale. It is there just for size reference (4" x 6"), and decorative purposes. State Your Team is not affiliated with, nor endorsed by the San Diego Chargers. The logo is used strictly for decorative purposes. - We're happy to accommodate several different types of custom requests. Examples of what we can do include: Reversed colors, placing hearts over different locations, and unique color combinations. If you'd like something different from what is pictured in the shop, please convo us prior to purchase so we can arrange for custom requests. Thank you. - Colors can appear slightly different on each computer screen.